Can you name four types of exercises found in a well-rounded physical fitness plan? Cardiovascular training is one. Resistance training is another. What are the other two types of exercises? I like to look at a physical fitness plan in terms of four major exercise, or training, areas: cardiovascular, resistance, and the often overlooked components of flexibility and balance. As we enter the New Year, let’s not forget about the importance of flexibility and balance… and not just in our physical wellness programs. The intention of this article is to bring forward a holistic way to think about your physical wellness plan. Before you begin or change any physical fitness program consult your doctor. Cardiovascular exercise is any type of exercise that increases the work of the heart and lungs. Typical forms of cardiovascular activities include walking, jogging, step aerobics, swimming, and biking. Cardio activity improves your heart/lung function and muscle mass; it’s a lot about endurance and is often called cardiovascular endurance. Resistance (aka muscular strength) exercises cause your muscles to contract against an external resistance such as weights, rubber bands, your own body weight, bottles of water, or any other object that causes the muscles to contract. Resistance exercises focus on your muscles and may include weight lifting, certain yoga postures and floor exercises, and simply lifting items as you clean your house! In addition to muscle strength, muscle endurance is important and goes hand in hand with cardiovascular endurance. Muscle endurance allows muscles to work longer without fatigue. Sure it is great to lift a certain amount of weight, but how good is that if you get winded while walking? Flexibility is about your range of motion and is required in your daily activities such as walking, bending, lifting, driving, etc. Stretching and yoga help achieve greater flexibility; stretching also helps with good posture and can reduce the risk of injury. 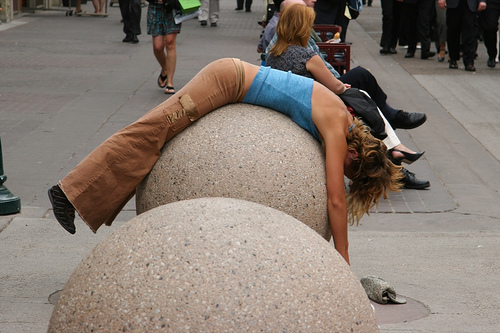 I like to think of flexibility (and balance) exercises as being versus doing- like the woman in the photograph. Balance training focuses on the communication between your mind and your muscles that allows the body to remain stable; it’s a lot about coordination. Balance helps prevent injuries, allows us to perform daily activities, and provides the foundation for cardio, resistance, and flexibility training. Balance should not be taken for granted. Balance training may include yoga, Tai Chi, outdoor biking and hiking, and specific exercises like standing on one foot. As you can see, these four exercise areas are interconnected, hence a well-rounded physical fitness plan takes all of them into consideration. To me, physical wellness is just one aspect of overall wellness and other areas of your life can positively impact your physical wellness. As discussed in “The Volunteer Wellness Effect”, doctors and scientists agree that people who volunteer are more likely to be happier and healthier than people who don’t volunteer. As shared in “The Unique Power of Gratitude” studies show that people who have an attitude of gratitude have higher levels of well-being (physical and emotional). Very Smart Girls take a holistic approach to physical fitness.